questions, comments or suggestions, please contact a member of the St.
Philip Athletic Association Board, a coach, principal or Father Gizler. Mission Statement: Our mission is the advancement of Catholic education by promoting sports and fitness programs for the students of St. Philip School. We strive to work in conjunction with the entire school community to support the physical health and well-being of all St. Philip students. our children’s education by volunteering our time and talent to encourage our students’ health and well-being, and sponsoring fundraising activities to facilitate the growth of school wellness projects. II. Authority: As part of the Pittsburgh Catholic community, the SPAA is subject to the policies of the Diocese of Pittsburgh for school athletics. In the event of a conflict between Diocese rules and any by laws set forth herein, Diocese rules control. A. It is the duty of the Principal to approve all activities and projects sponsored by the SPAA. The pastor of St. Philip has final responsibility for the parish school and the SPAA shall function only with his consent. B. The Principal shall act in an oversight capacity regarding SPAA fundraising and budget proposals/amendments. C. As an organization raising funds in the name of the parish school, the SPAA is under the direction of the Principal and ultimately the pastor. D. These by-laws, in conjunction with school policies, govern the sporting programs at SPS. Amendments to the by-laws may be made by majority vote of the Board. III. Membership: The membership shall be comprised of parents/guardians of all registered families, as well as the faculty and staff of St. Philip School. 1. The SPAA shall establish and maintain a budget to maintain the athletic programs of SPS. 2. The SPAA may have one checking account at a local bank approved by the pastor. If additional accounts are needed, approval is to be obtained from the diocesan finance office. 3. Authorized signatures may be made by any Board member upon presentation to the bank and completion of appropriate signature form. At the end of a Board member’s term, the Board member shall notify the bank that his/her signature card is to be revoked. 4. Bank reconciliations should be prepared monthly, as soon as the bank statement is received. 5. Contributions received by the parish or school on behalf of the Athletic Association should be counted by 2 or more people from the parish or school, following the same internal control procedures used for all other receipts. B. Invoices: Upon receipt of an invoice, the Treasurer will verify that the material was received or service provided (by reference to an initialed receiving document, if available.) If there is not a separate receiving document, indicate in writing on the invoice whether the material was received or service provided and initial and date. Schedule the invoice for payment appropriately and file accordingly. In the absence of a vendor invoice for amounts over $250, a written check request is required before a check can be issued (emails are acceptable). Vendor’s month-end statements should be reconciled to vendor invoices. Disbursements should not be made from statements without supporting documentation. C. Items included in approved budget will be remitted by the Treasurer upon request. D. Emergency needs of less than $500 can be approved by any board member. E. Requests for funds not included in the approved budget for items less than $1500 can be made in writing to a Board member. Such requests will be presented and voted on at the next monthly Board meeting or by informal email vote. Disbursement will follow according to the vote. A. Board of Directors: The Board of Directors shall consist of nine Officers, in addition to the Principal and the Pastor (Administration). The nine volunteer positions are President, Secretary, Treasurer and six Vice Presidents of Sports as outlined herein. These nine positions are elected positions and shall be filled by parents of current SPS students and are not salaried or employees of the school or parish. Voting for new board positions will commence in the Spring with new members approved before the end of the school year. Nominations for new board members may be made by parents of SPS students, faculty, board members or Administration. Serving on the board requires dedication and sacrifice and only those nominees committed to volunteering should be considered. President: The President is elected by the Board from the pool of candidates expressing interest by the deadline. The President serves a minimum of two years. If only one candidate is interested, that individual may be appointed by the outgoing President upon notification to the Board and a ten day time period for objection and/or inclusion of additional candidate for vote (provided clearances are up to date.) The President performs all duties pertaining to the office, sets the agenda for the Board meetings with input from the Board and presides over all meetings of the SPAA. The President coordinates the leadership of all committees, shall be an ex-officio member of all committees, establishes special committees as needed and shall receive notices of all SPAA meetings. The President shall be a check signatory. The President shall assist all VPs to the extent necessary or requested. The President does not vote unless the Board vote results in a tie. Treasurer: The Treasurer is a volunteer duly elected by the existing board from the pool of interested candidates and serves for a minimum of 2 years. The treasurer shall present financial reports at each SPAA meeting along with any budget statements and recommendations regarding finances of the Board. The Treasurer will complete and file an annual financial statement with the Board by August 15th for the previous fiscal year. The Treasurer shall be a check signatory. Secretary: The Secretary is a volunteer duly elected by the existing board from the pool of interested candidates and serves for a minimum of 2 years. The secretary shall be responsible for keeping the minutes of each board meeting and updating registration, rosters and required physical forms for all sports. The Secretary shall assist with the gym calendar on the website and shall coordinate with the PTG communications with parents and faculty through email updates and written communications. The Secretary may be a check signatory. Each Vice President shall be responsible for overseeing the management of the sport to include concessions. VPs will assist coaches in decisions regarding practice times, relationships with parents and student athletes, as well as equipment needs, league registration and participation in tournaments. Vice Presidents may be check signatories. Vice Presidents may serve as coaches. Whenever possible, board terms shall be staggered to preserve continuity. 1. All matters of policy and administration of the SPAA shall be vested in this Board. 2. The Board shall decide on all fundraising and activities and shall propose the allocation of organization funds. 3. The Board shall have the right to fill any vacancies on the Board of SPAA by vote as described more fully herein. 4. The Board shall have the right to add or delete committees. 5. The Board shall be responsible for hearing issues and setting the agenda of all general meetings. 6. Any person or group of St. Philip School desiring to address a meeting of the SPAA board shall notify the President or Principal not less than ten days prior to the next meeting of the Board. Upon receipt of such request, the President or Principal shall contact individually or collectively the remainder of the Board. It shall require an affirmative vote of six of the ten officers to approve such a request and, granting such a request, a majority of these officers shall set forth the amount of time and the nature of the participation in the deliberations of the Board to be granted each separate request. 7. The Board will address all written communication from the membership. 8. The Board may make recommendations concerning removal of coaches when necessary as outlined in XII(3), (5) herein. 9. The Board may make recommendations concerning suspension or expulsion of an athlete from a team when necessary, as outlined in XII(2),(4) herein. A. The Board shall meet at least four times a year. The times for the meetings should be set as early in the year as possible and publically announced to faculty and parents. B. The Board may schedule additional meetings as appropriate. C. All meetings shall begin with a prayer. D. All meetings shall be conducted with civility and respect for all attendees. E. Upon motion of any Board member, which is seconded by another, a vote may be taken to suspend the meeting if a Board member or parent participant fails to respect these rules. A. When possible, nominations for new Board members to fill vacancies shall be solicited at least three months prior to the end of the school year for terms expiring or becoming open for other reasons. New terms begin June 1st. Outgoing officers will make every effort to educate and assist new officers when needed. B. Voting shall be verbal or by secret ballot as decided by the Board members attending the meeting. All officers shall be voted on individually. C. In the event there is only a single candidate nominated for each office, provided the candidate meets the required clearances and is willing to serve, the candidate shall be appointed to the board unless objection or concerns are raised. If concerns are raised, a vote shall be taken to approve the candidacy. VIII. Amendments Amendment to these by-laws shall be presented to the Board, voted on, and approved by two-thirds majority of the full Board. IX. Conflict of Interest Clause –the Board shall be alert to situations which have the appearance of a conflict of interest and avoid actions that embarrass themselves or the school. Conflicts of interest can arise when a Board member will derive a private benefit from Board decisions. The Board member will disclose any real or potential conflict of interest. The Board will determine if there is a conflict and what action, if any, the Board should take. Two members of the same family cannot serve simultaneously as officers and/or Board members (this does not affect the ability of two family members to volunteer as coaches whether together or for different sports). X. Grievance Policy: A parent or guardian having a complaint about a coach or a sporting event shall wait 24 hours before addressing the coach. If the coach cannot be reached, or if the parent feels additional measures are needed after speaking to the coach, the parent will contact either the VP of the sport, the principal, or the President in writing. If the VP or the President are contacted, he/she shall pass the complaint along to the Board and the Principal. The Principal shall decide if the Complaint is one which should be governed by the Board or if it will be handled exclusively by the Administration. Any Complaint not concerning sports is assumed to be outside the Board’s jurisdiction. If the Board is to address the complaint, the complaint shall be reviewed by the full Board either via email or at a regularly scheduled meeting if that meeting is to take place no more than 7 days from the date the complaint was received. A meeting may be scheduled with the Board for the purpose of discussing the Complaint and such meeting may be considered a “closed door meeting” and not open to individuals other than board members if necessary. Due to the urgency of scheduling the meeting, Board members may attend by phone. Discussion of the Complaint will be made with the goal of conflict resolution. If additional information is needed a request will be made to the Principal who shall conduct such further investigation in a timely matter. Upon completion of the investigation, if the matter remains one under the jurisdiction of the board, the Principal shall report to the President or the Board who then shall determine necessary action to be resolved by a full vote of the Board. XI. Voting: The Board shall vote on issues concerning athletics at St. Philip School including the application of individuals for coaching and assistant coaching positions, resolving complaints made by parents, students or others, funding and financing issues, new Board members and other sports related issues. If a Board member believes an issue put to vote should not be decided by the Board, that member(s) shall advise the Principal and the Board of the objection. The Principal will have the final authority to determine if the Board has the decision-making authority on the issue with the exception of of issues meeting the description set forth at XII (5). All decisions will be consistent with Diocese policies. Quorum: Voting at meetings does not require the full attendance of the Board. If a full board is not present, a majority vote of all those present and voting, shall dictate the passage of the vote. However, no vote will be taken if less than 5 (five) Board members are present and voting. Abstaining: Board members may abstain from voting. A vote in abstention shall not be counted for or against the issue and shall be a “non-vote” not included in the count for majority. If five or more Board members abstain from voting on an issue, the issue will be tabled and referred to SPS Administration for final consideration. Participation in SPS Athletics is limited to students of SPS or to students of other Catholic schools consistent with the Diocese policy for athletes playing for other Diocese schools. 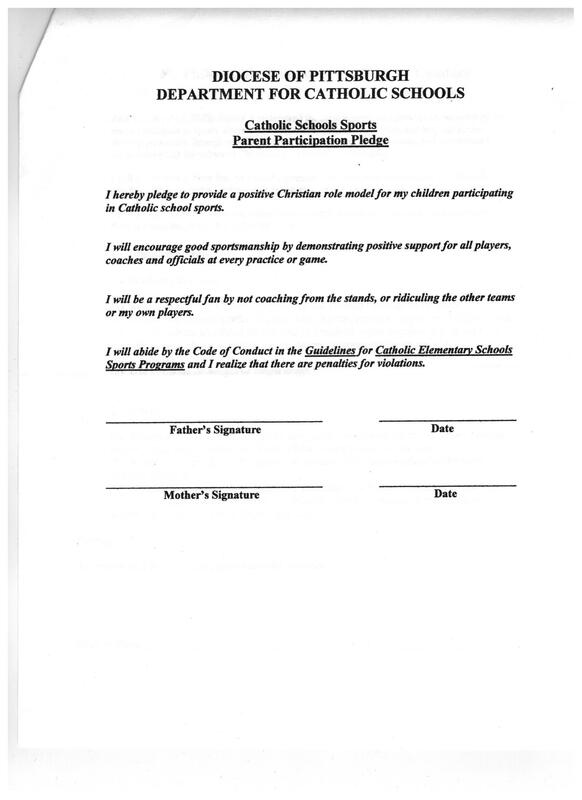 Students from non-Catholic schools or home schooled students are not eligible to participate in SPS sports. Administrative issued discipline: in the event that a student is issued discipline by the administration which includes exclusion from sporting events, a board member will convey that message to the appropriate coaches immediately. Students may not participate until Administration removes the suspension. Dismissal: The Board and Administration retain the right to remove a student athlete, parent or coach from participation in SPS sporting events if the party violates these by-laws or school policies. Exceptions: If a student, coach or family member’s behavior rises to the level of violence, threatened violence or involvement of law enforcement, the Board will be fully informed throughout the process so that proper communication and safety can be maintained, but will not be involved in the disciplinary measures to be implemented, which thereafter shall be the addressed by the Administration. Upon review, the Board will submit the letter to the administration for clearance approval. Once clearance approval is received, the Board may vote to approve or disapprove the prospective coach. If clearances are not approved, the candidate will be informed by the Administration of the deficiencies, with instructions as to how to obtain the clearances. Alternately, the Administration may inform the President or VP of the respective sport who shall then notify the candidate of the deficiencies. At all times, however, the Administration maintains control and authority over clearances. NO PERSON SHALL COACH IN ANY CAPACITY UNTIL THE DIOCESE HAS ADVISED THAT CLEARANCES HAVE BEEN MET. NO EXCEPTIONS. If a Board member is aware that a coach who has not been cleared is coaching at practice or games, that board member shall advise administration who will take appropriate action. If the Board votes not to approve the candidate, the candidate may appeal to the Administration for reconsideration. After consulting with Administration, the Principal shall notify the board of his recommendations and the board shall vote again. The second vote of the board shall stand as the final decision. Coaches who have already been vetted and approved for seasons immediately prior do not need to be voted on again; however shall advise the Board prior to the start of the season of their intention to continue coaching so that the board is aware of vacancies or need going forward. The Board may query the existing coaches to determine their intentions. 1. All requests for uniform purchase must adhere to the following standards established by the SPAA Board.No uniforms will be ordered or worn which do not display the SPAA approved logo or colors.Only the SPAA Board may approve the purchase of new uniforms.Only approved SPAA uniforms may be used by the team members when participating in SPAA sporting events. Coaches and/or VPs will review the condition and number of uniforms at the start of the season no later than one month before the first practice. If, after notification, the Board determines that additional or new uniforms are needed, the Board will work with the coach in determining the number of uniforms needed and the approximate time for ordering. No uniform will be ordered unless and until the Board approves the price, color, design and quantity. Coaches are encouraged to review the condition of the uniforms at the end of the season so to assist in early recognition of need. The branding of St. Philip School with respect to affiliated athletic teams and athletic initiatives remains under the control of the SPAA. Changes of the branding will occur only with final approval of the Principal and the Pastor. The school mascot is the Trojan and no athletic team shall be known as anything other than “St. Philip,” “the Trojans” or “St. Philip Trojans,” whether in uniform, registration, participation in tournaments or reference in newsletters and communications. No names or nicknames will appear on the jerseys. Coaches will be provided a key/fob for entrance to the gym during their season. Fobs are to be returned at the end of the season. Coaches are expected to work together to coordinate use of the school gym and time for practice. SPAA expects coaches to also accommodate the school’s usage of the gym for play practice, talent show and other events. The gym must be left in good condition with lights off when leaving. Teams who repeatedly violate this policy may lose gym time. As many SPS athletes play multiple sports, coaches are expected to work together when scheduling practices and using the gym. Reasonable understanding of scheduling conflicts between sports is anticipated and expected. SPS athletes are expected to participate to the best of their ability for each sport that they choose and should not over extend themselves to the detriment of other players. For conflict resolution, the in-season sport shall have the firs consideration for gym time. JV and Varsity levels shall have first consideration over developmental level programs. Registration fees for the season are now based on a per sport fee scale. Registration for all St. Philip Athletic Association programs will be held in the season prior to the upcoming season. All registrations must be accompanied by the registration fee. Refunds will be considered on a case by case basis and none will be made once the season begins and participation starts. Medical/insurance forms are required for all students and must be submitted before a sports season begins. Only one form is required per student. No child will be permitted to be added to a team roster without completing the registration form and providing proof of physical clearance from a physician, this includes practices prior to a season. Diocesan rules prohibit offensive conduct by players, families and coaches. Verbal abuse of officials, opposing teams and players, or our coaches and players will not be tolerated under any circumstances. 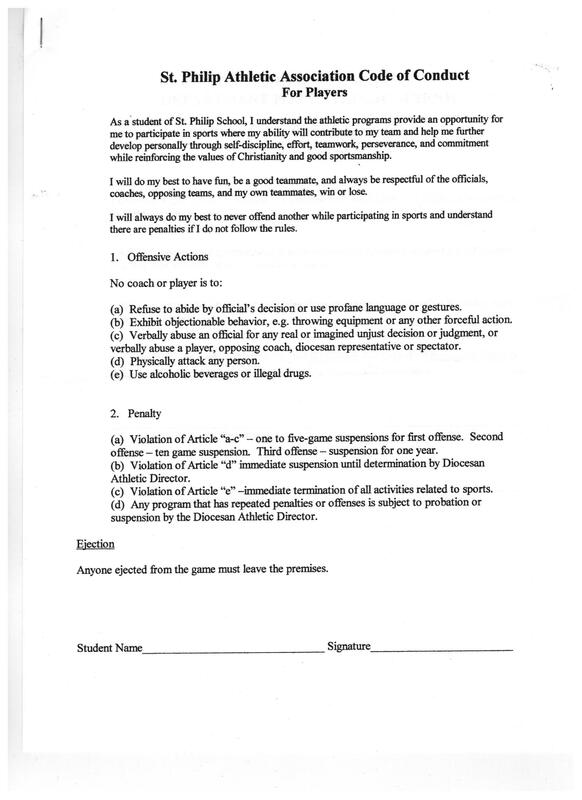 Any player, coach or parent displaying poor sportsmanship, foul language, or any conduct unbecoming of a member of St. Philip School in practice or at games will be suspended from games and practices for a period of time. Subsequent violations may result in student removal from the team and/or parent banishment from all SPAA activities. No parents are permitted on the bench during the games except for assistant coaches and official scorekeepers. Practices are open for parents to observe but "coaching" by parents from the sidelines or stands during a practice is restricted. Parents are not to stay at practice without the coach's consent if they have previously been unable to abide by the set practice rules. Several organizations very generously permit us to use their facilities - BCHS, OLSH, St. Paul's Seminary, Carlynton School District, et al. We must make sure we leave these facilities in the condition we find them. It is important that all families follow the rules as posted at each facility. Parents will be responsible for any damage incurred by their child. If a parent would like to discuss an issue with a coach, please make arrangements to speak with the coach at a time convenient for both parties. Please do not approach the coach from 1 hour prior to an activity, during or 24 hours after the activity has completed - game or practice. If you have further issues, please contact the vice president for that activity. If you are still not satisfied, please contact the president of the Athletic Association. You are always welcome to any SPAA meeting to discuss your issues with the board but request that you notify the President prior to the meeting so you may be added to the agenda. Accept all decisions rendered by the coaches and referees. Your acceptance of their decisions will encourage your child to respect these dedicated people. All parents, coaches and participants must sign the code of conduct. No student may participate in any activity if they miss school on the day of the activity (practice or game). No student that is on academic or behavioral probation may participate in any activity until this has been rectified. No student that does not have an up to date physical clearance form and medical insurance form may participate in any activity until these have been addressed. No student may participate in any activity unless all registration fees are paid or arrangements have been made for these with the Athletic Association. No student will be added to a roster for an upcoming season if registration fees remain unpaid from a previous season or school year and if no arrangements for payment have been made. No student will be compelled to move down to a team comprised of mostly younger players. The exceptions to this are if this movement is initiated by the parents or guardians or if the child has not participated in that activity at St. Philip School. All movement of players must be approved by the SPAA Board. Parents will be required to work at the concession stand or the admission door when they are assigned as coordinated by the team parent or additional fees may be incurred. If you are unable to work or choose not to work, you will be responsible to find a replacement. The concession stand provides a major source of income for the St. Philip Athletic Association which is why it is imperative that all families participate in this activity. Every team will have a Team Parent who will be the contact between the Athletic Association, the coach and the players' parents and will help the coach with non-coaching activities. Team and individual pictures will be scheduled as appropriate for each activity. Times and dates will be announced. An all activity banquet will be arranged by the Athletic Association and conducted during the school year. A middle school dance will be held in conjunction with the banquet. All coaches and those wishing to coach at St. Philip must submit a letter of interest regarding their experience, qualifications, and coaching philosophy and how it relates to youth sports. Letters should be submitted to Dr. Dougherty who will together with the Executive Board review all letters of interest and select those individuals whose experience and philosophy will best serve the student athletes of St. Philip. The board will designate the head coaches and assistant coaches. Head coaches may suggest individuals for assistant coaching positions but all decisions and approvals will be at the sole discretion of the SPAA. Appointed coaches may not, at any time, add assistant coaches or volunteers without board approval. All coaches must meet the criteria for the coach's certification as established by the Diocese of Pittsburgh. All coaches are subject to removal at any time by a majority vote of the Board. All coaches must receive Diocesan accreditation and Act 33/34 clearance. All coaches must attend Protecting God's Children training. Coaches will be held to the Code of Conduct as described in the Diocesan Guidelines. Coaches must act professionally at all times and be a positive role model for the students. A coach or an adult must accompany the team in the locker rooms at all times. If the coach cannot accompany the team, the coach will request that another adult with appropriate clearances and known to team, board or school accompany the team. Visiting teams should be accompanied by an adult in the locker rooms at all times. Athletic programs are available from grades K through 8 for boys and girls but participation guidelines vary by activity. Pee Wee - Grades K through 1. These children will work on skills and game rules. Some non-competitive games will be played. Developmental - Grades 2, 3 & 4. This is an instructional program and all players will be given an equal opportunity to play. Junior Varsity - Grades 5 & 6. Grade 3 & 4 students may play at the discretion of the coaching staff. The maximum number of grade 5 & 6 players on a team before elevating the lower grade students to this team is 18. Criteria for 3rd & 4th grade students to play JV are: Practice performance, Game performance, Sportsmanship and Attendance. Varsity - Grades 7 & 8. Players in the 5th and 6th grade will be eligible to play in a varsity game at the discretion of the coaching staff. The maximum number of grade 7 & 8 players on a team before elevating the lower grade students to this team is 18. Criteria for 5th & 6th grade students to play Varsity are: Practice performance, Game performance, Sportsmanship and Attendance. The Pee Wee team players do not require a uniform. All players must provide their own shin guards. Soccer spikes are not required but are recommended. The Developmental team players will receive a green uniform shirt and socks. It is the responsibility of the players to provide their own black shorts, shin guards and spikes. Goalies are required to wear helmets and these will be provided. JV and Varsity team players will be provided with green/white game jerseys, and green socks. It is the responsibility of the players to provide their own shin guards and spikes. Goalies are required to wear helmets and these will be provided. Uniforms must be returned to the coach at the end of the season but the players may keep the socks. If a uniform is not returned at the end of the season, the family will be charged a replacement fee for each article. Uniform care is the responsibility of the players and parents. Please follow washing instructions. Do not put numbered jerseys in the clothes dryer as numbers tend to deteriorate. All other apparel above and beyond the uniform required for each sport is subject to SPAA Board approval. Practice times and days are dependent upon the availability of the coaches and fields. Coaches will establish and communicate these to the players. Home games are generally played on Saturdays at St. Paul's Seminary Field. Developmental - Grades 3 & 4. This is an instructional program and all players will be given an equal opportunity to play. Junior Varsity - Grades 5 & 6. When sufficient numbers of students register, there will be two teams registered with the Diocese and playing in different sections. These teams will be chosen according to ability so as to provide maximum opportunity for skills development to all the student athletes. The maximum number of grade 5 & 6 players on a team before elevating the lower grade students to this team is 9. Criteria for 3rd & 4th grade students to play JV are: Practice performance, Game performance, Sportsmanship and Attendance. All players should play in every game though playing time may not be equal. Varsity - Grades 7 & 8. When sufficient numbers of students register, there will be two teams registered with the Diocese and playing in different sections. These teams will be chosen according to ability so as to provide maximum opportunity for skills development to all the student athletes. Teams may be mixed according to ability and not grade level as all 7th and 8th grade students are eligible for varsity participation. The maximum number of grade 7 & 8 players on a team before elevating the lower grade students to this team is 9. Criteria for 5th & 6th grade students to play Varsity are: Practice performance, Game performance, Sportsmanship and Attendance. All players should play in every game though playing time may not be equal. Pee Wee players will receive a t-shirt to wear for any scrimmages. Developmental players will receive a reversible basketball uniform. Players must provide their own socks and shoes. JV and Varsity players will receive reversible basketball uniforms. Players must provide their own socks and shoes. Practices will usually be held in either SPS gym or St. Paul's Seminary. The Pee Wee program will practice once per week. Practice times will be assigned when rosters are determined. If unable to attend practice, please notify the coordinator or coach in advance. If practice is cancelled for any reason, the coach or coordinator will make every attempt to notify you. Practices are open to parents throughout the season. Parents are not permitted to participate in practice, offer coaching from the stands, or distract their player or team. Varsity and JV home games are played at Bishop Canevin High School on Saturdays. Developmental and Pee Wee games are played at St. Philip School or other facility (BCHS, St. Paul's, etc.) as available. Away games are dependent on the home team facility schedule. Junior Varsity - Grades 4, 5 & 6. Varsity - Grades 7 & 8. Players in the 5th and 6th grade will be eligible to participate at a varsity game at the discretion of the coaching staff. Criteria for 5th & 6th grade students to participate at a Varsity game are: Practice performance, Game performance, Sportsmanship and Attendance. Skirts, vests and pom-poms are given to each Varsity and JV cheerleader. Shoes, socks, body suits and kick pants are required purchases of each cheerleader. Uniforms and pom-poms are must be turned in to the coach at the end of the season. If a uniform is not returned at the end of the season the family will be charged the replacement cost for that equipment. All cheerleaders are expected to attend the practice as scheduled for their squad. If unable to attend practice, please notify the coordinator or coach in advance. If practice is cancelled for any reason, the coach or coordinator will make every attempt to notify you. Varsity cheerleaders will be performing at home boys and girls basketball games. JV cheerleaders will be performing at home boys and girls basketball games. These games are held at Bishop Canevin High School on Saturdays. Junior Varsity - Grades 5 & 6. Grade 4 students may play at the discretion of the coaching staff. The maximum number of grade 5 & 6 players on a team before elevating the lower grade students to this team is 8. Criteria for 4th grade students to play JV are: Practice performance, Game performance, Sportsmanship and Attendance. Varsity - Grades 7 & 8. Grade 5 & 6 students may play at the discretion of the coaching staff. The maximum number of grade 7 & 8 players on a team before elevating the lower grade students to this team is 8. Criteria for 5th & 6th grade students to play Varsity are: Practice performance, Game performance, Sportsmanship and Attendance. JV and Varsity team players will be provided with a uniform top and socks. Kneepads must be worn at all matches and practices as per Diocesan rule. Players are responsible to provide their own shorts (boys - black shorts & girls- black spandex), socks and footwear. Uniform care is the responsibility of the players and parents. Practice will be held 2 times per week at the beginning of the season and then twice per week thereafter. Practice times will be assigned when rosters are determined. All players are expected to attend the practice as scheduled for their squad. If unable to attend practice, please notify the coordinator or coach in advance. If practice is cancelled for any reason, the coach or coordinator will make every attempt to notify you. Home matches are played at Ss. Simon and Jude School on Sunday evenings. Away matches are dependent on the home team facility schedule. Junior Varsity - Grades 4, 5 & 6. Grade 3 students may play at the discretion of the coaching staff. The maximum number of grade 4- 6 players on a team before elevating the lower grade students to this team is 9. Criteria for 4th grade students to play JV are: Practice performance, Game performance, Sportsmanship and Attendance. Varsity - Grades 7 & 8. Grade 5 & 6 students may play at the discretion of the coaching staff. The maximum number of grade 7 & 8 players on a team before elevating the lower grade students to this team is 9. Criteria for 5th & 6th grade students to play Varsity are: Practice performance, Game performance, Sportsmanship and Attendance. JV and Varsity team players will be provided with a uniform top. Runners are responsible to provide their own black shorts, socks and footwear. Uniform care is the responsibility of the players and parents. Practice will usually be twice per week at Carnegie Park for Cross Country and Bishop Canevin High School for the Track Team. All players are expected to attend the practice as scheduled for their squad. If unable to attend practice, please notify the coordinator or coach in advance. If practice is cancelled for any reason, the coach or coordinator will make every attempt to notify you. Home meets for Cross Country are held at Carnegie Park. Away matches are dependent on the home team facility schedule.